With their Photorealism, Robert Bechtle’s works capture the essence of modern, postwar American culture. The manicured lawns bathed in sunlight, the well-kept houses, the kids, the cars . . . all of suburbia’s manifestations are explored and exploited in his works. He elevates the mundane and commonplace to something more, an anonymous yet intimate view of ourselves. It is important to remember that his works are not photographs. They are masterfully painted pieces that are touched by the artist’s ideas, vision, hand, and point of view. A photograph captures what is there before us. Bechtle takes that moment and paints it as he sees it, not merely as the camera saw it. Like the Impressionists, he shows a fleeting glimpse of daily life, touched by transient light. Painting from photographs allows Bechtle to fully examine and capture that single moment in all its infinite detail. He then interprets the moment by selecting the details that he will paint. The overall flatness of many of his pieces creates a feeling of loneliness and emptiness amidst the picture-perfect settings. 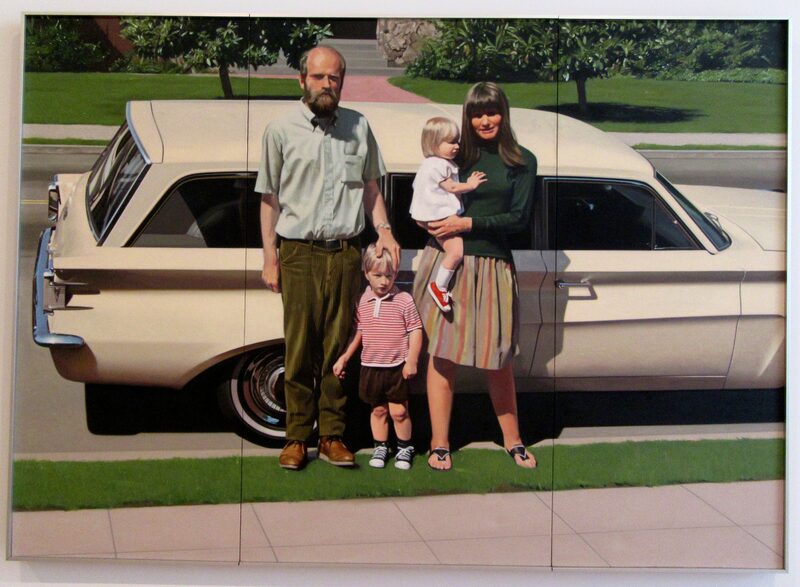 In Bechtle’s oil painting ’61 Pontiac (1968-69) the family at the center of the image is the artist’s own. Standing beside his wife, with their two small children, they are the picture of familial complacency. They fully inhabit their own world, which is visible from where they stand. The house, the yard, the station wagon – this is their domain. Their pose amidst this seems almost uncomfortable, as if they want to move but are plagued with inertia. The field of view is devoid of anything other than the family and its possessions. The painting has a flatness accentuated by the fact that all fields of the painting are in focus, unlike with a photograph where depth of field creates some areas that are more crisp than others. It is as if there is no delineation or value given to any subject in the painting—the lawn is as much a star of this work as is the car or the blonde children. Robert Bechtle plays on American desires and dreams, poking dead-pan fun at the ultimate banality and emptiness of achieving those dreams. The stark reality of his work is that it says as much about Americans’ feelings of alienation as it does about the ongoing quest for the American Dream.